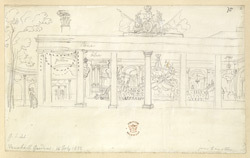 This pencil drawing is of a walkway in Vauxhall Gardens, London. Established in the 17th century, Vauxhall Gardens became an important open-air venue for fashionable Londoners. The site was modified in the 1720's with the addition of numerous walks, statues and tree-lined avenues. There were many notable visitors, such as Samuel Pepys, Johann Sebastian Bach and William Hogarth. Firework displays, ballets, concerts and masquerades were regular events in the gardens. Wolfgang Amadeus Mozart gave several superb performances here during the 1760's. The gardens existed for nearly two hundred years and were eventually sold for redevelopment in July 1859.